Obama wins. Get ready for the contrarian trade and buy the market as pessimism climaxes. 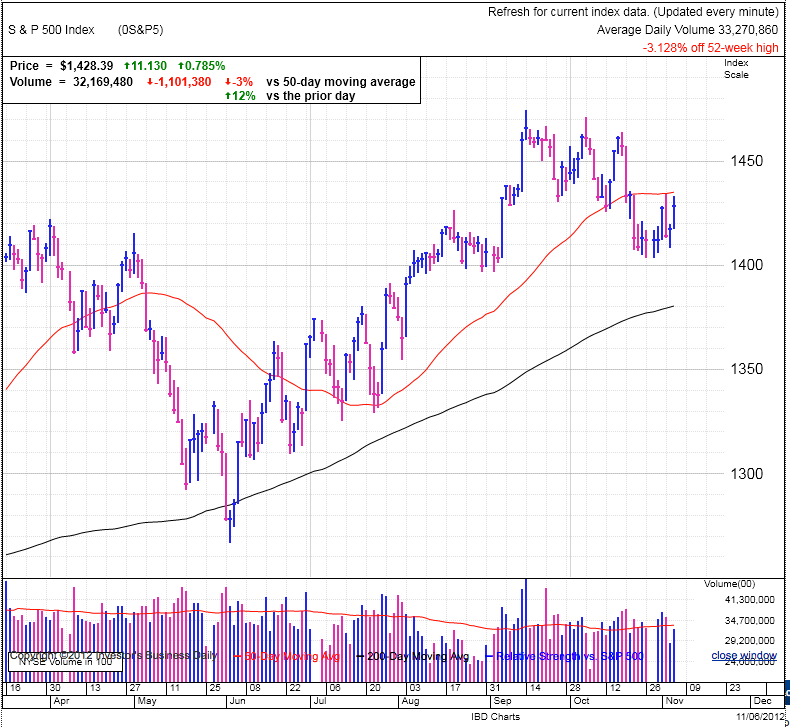 The market rallied and pushed toward the 50dma on Tuesday. No doubt bears were chased out of the market as we reclaimed all of Friday’s selloff. Low volume over the last couple days made the market more vulnerable to larger swings and enabled this volatility. With the election decided, hopefully calm trade will return to the markets. Of course I have little doubt the market will start obsessing about something else before the end of the week. I suspect there were a fair number shorts anticipating the market to crash on an Obama reelection, but rather than reward their ‘insight’ the market sent them scurrying home with their tail between their legs Tuesday. It will be interesting to watch how the market reacts Wednesday when the result is official. Will we see a wave of retail investors who were hoping for a Romney win calling their broker and telling them to sell everything? Or will we see the rest of the shorts expecting the market to crash under an Obama win get chased out as we break above the 50dma? No matter what your political affiliation, you have to respect the support the market is finding in spite of all the dire headlines ranging from fiscal cliffs to European contagion. The trap a lot of traders fall into is they try to predict what the market ‘should’ do instead of taking clues from what the market is doing and how other traders are positioned. There are a million reasons the market should go down, but it knows that and it chooses to go higher instead. That is a very powerful signal. As for the contrarian trade, what is the least expected outcome after an Obama reelection and an impending fiscal cliff? A rally. The knee jerk reaction to Obama’s win could be a selloff on Wednesday, but get ready to buy that dip once the slide runs its course. There are four things, and only four things that move the markets. Abundance of buyers, abundance of sellers, lack of buyers, and lack of sellers. This is nothing more than supply and demand. If we have a selloff tomorrow, it will be short-lived because we’ll run out of sellers pretty quickly. And who knows, we might not even see that selloff if most traders sold ahead of the election and the market choses instead to crush bears short the market by rallying strongly out of the gate. As for a longer view, I really don’t see how the market could crash from here since almost all the negative headlines are already priced in. You can safely ignore everything everyone is talking about. The only thing to fear is what no one is talking about. I could easily be wrong because there are no guarantees in the market, but right now the high-probability trade is a rally because the way other traders are positioned. After everyone sells, supply dries up, and there is nowhere to go but up. We might see some near-term softness, but that only gives us even more attractive levels to buy in at.